NIH Director Francis Collins delivering his keynote address at The Allied Genetics Conference. 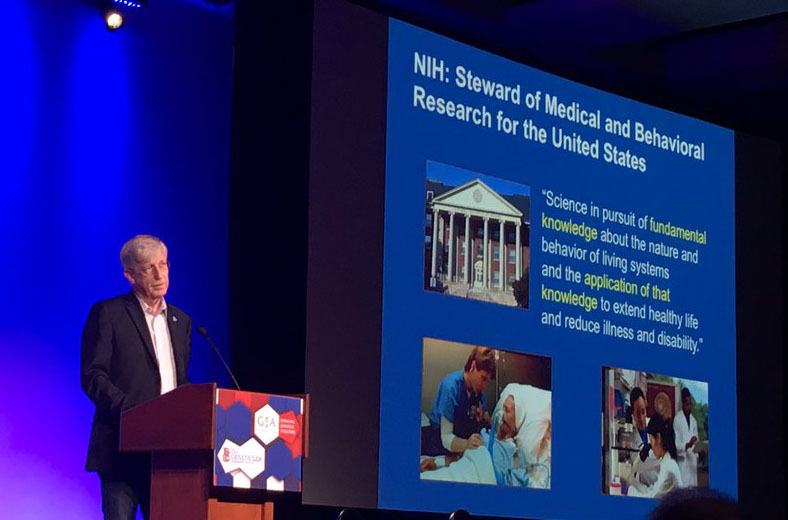 Last week at The Allied Genetics Conference (TAGC), National Institutes of Health (NIH) Director Francis Collins provided an overview of model organism support from his agency. Collins used a new analysis performed by NIH staff to address concerns expressed by many of the model organism researchers gathered at TAGC, particularly a 2015 analysis by Michael Wangler, Keith Yamamoto, and Hugo Bellen that suggested NIH grant support for Drosophila research is declining. The new data, which was made publicly available on the Open Mike blog at the time of his talk, evaluated funding levels for Drosophila, Caenorhabditis elegans, Zebrafish, and Xenopus laevis at NIH since 2008. The key finding is that the award rate for R01 proposals using model organisms is higher than overall R01 award rates. In his talk, Collins presented the data above with the conclusion that you’re more likely to be funded at NIH if you use one of these model organisms. However, there are a few caveats. The comparison between model organism grants and award rates across NIH may not be the best control because model organism grants are disproportionately funded by NIGMS, which had a 29.6% award rate in 20151. This means institutes that fund far less model organism research, like NCI (13% award rate), NICHD (11.5% award rate), and NIBIB (12%), decrease the agency-wide award rate to 18%. The data also discounts those who are funded through other mechanisms, such as K and P awards. Collins also discussed funding of model organism databases, citing the open letter for support of these key resources, which had over 11,000 signatures at the time of his talk. Recognizing the invaluable contribution of these databases to the evolution of Big Data, he discussed ways that they might move forward more efficiently as a part of the Big Data to Knowledge (BD2K) initiative at NIH. While future funding for model organism databases remains uncertain, Collins was clear that changes were on the horizon. Historically, this shared resource has been funded by NHGRI, however, NHGRI Director Eric Greene instructed database leaders to identify new funding sources by 2020 and integrate the organism-specific databases into a single resource. Leaders of the model organism communities and GSA are working together with NIH to identify solutions that will maintain the integrity of the databases and be more cost-efficient. A group of TAGC attendees concerned about the future of model organism databases took the opportunity to start #saveMODfunding on Twitter.